Cavan’s Luke Fortune grabbed the other goal for the Belfield side. Con O'Callaghan takes on Andy McGowan. 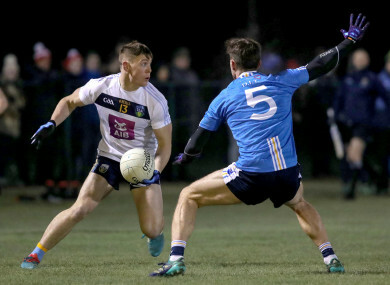 THE BELFIELD PITCH was almost frozen solid by the end of the game, but hosts UCD brushed off the cold conditions to book their place in the Sigerson Cup quarter-finals. The reigning champions will meet DCU in the last eight of the third-level competition, after comfortably seeing off DIT by 17 points in tonight’s round 3 clash. Evan O’Carroll, Con O’Callaghan and Luke Fortune grabbed the goals on a night where John Divilly’s side had too much class for their opponents. UCD’s second and third goals arrived in the closing five minutes to put the gloss on their victory, but this game was over long before the final whistle. DIT defended reasonably well for the majority of the game against UCD’s star-studded attack, which also included Conor McCarthy, who came on as a 68th-minute sub in Monaghan’s win over Dublin on Sunday. Up front was where the problems lay for DIT and they managed just six points, three in each half, on a night where the ball didn’t stick in attack. Laois forward O’Carroll finished with 1-4, while former Young Footballer of the Year Con O’Callaghan grabbed 1-2 and left another two goal chances behind him. But it was Corofin defender Liam Silke who stood out the most for the victors, thriving in a man-marking role on All-Star Brian Howard. It was difficult for Howard to impress given UCD’s dominance, but Silke broke forward for three points in a superb display on the half-back line. O’Carroll’s goal arrived after a strong run and finish in the 16th minute, which handed UCD a seven point lead at half-time. O’Callaghan, Stephen Coen and Silke raised white flags shortly after the break to edge the hosts further in front. Wicklow’s Ross O’Brien kicked a fine point for DIT and the introduction of Killian O’Gara, younger brother of Dublin forward Eoghan, and Westmeath ace Luke Loughlin breathed some life into their attack. But UCD outscored the losing team by 2-7 to 0-3 in the second period as O’Carroll slotted over a brace of frees and Darren Gavin chipped in with a point from play. The late goals from O’Callaghan and Fortune put the icing on the cake for UCD, who’ll face a far sterner test against DCU the next day out. Scorers for UCD: Evan O’Carroll 1-4 (0-4f), Con O’Callaghan 1-2, Liam Silke 0-3, Luke Fortune 1-0, Barry McGinn 0-2, Stephen Coen, Darren Gavin and Conor McCarthy 0-1 each. Scorers for DIT: Tom Keane 0-2, James Conlon, Oisin Lynch, Ross O’Brien and Killian O’Gara 0-1 each. 19. Liam Hughes (Longford) for Hurley (58). Meanwhile, IT Carlow saw off UL on a scoreline of 0-12 to 0-9 in tonight’s other Sigerson Cup game to seal their place in the last eight. Email “O'Callaghan and O'Carroll hit 2-6 between them in UCD's 17-point win over DIT”. Feedback on “O'Callaghan and O'Carroll hit 2-6 between them in UCD's 17-point win over DIT”.